As a follow-up to my last post, I would like to briefly return on the claim that the representative agent assumption is also well alive in microeconomics, not only in macroeconomics. As Wade Hands explain in several papers I linked to in the previous post, the representative agent assumption in microeconomics finds its roots in the study of consumer’s choice and more generally in demand theory. This may seem surprising (at least for non professional economists) since in virtually all microeconomic textbooks the study of demand theory starts from the analysis of the individual consumer’s choice. This reflects the fact that initially ordinal utility theory was conceived as a theory of the rational individual consumer with market demand simply derived through the horizontal summation of the individual demand curves. Similarly, in his seminal article on revealed preference theory, Samuelson started with well-behaved individual demand functions on the basis of which he derived a consistency axiom nowadays known as the weak axiom of revealed preference theory. However, as it is well-known, the idea that the individual consumer is rational in the specific sense of ordinal utility theory (i.e. the consumer’s preferences over bundle of goods form a complete ordering) or revealed preference theory (i.e. the consumer’s choices are consistent in the sense of some axiom) is a disputed one, inside and outside economics. A foundational issue for economics has been, and still is the relationship between individual rationality and what can be called “market” or “collective” rationality. To ask the question in these terms already marks a theoretical and even an ontological commitment: it presupposes that the rationality criteria we apply to individual agents are also relevant to study collective behavior. Some economists have always resisted this commitment. However, acknowledging the fact that individual consumers may not be rational, the issue is obviously an important one for the validity of many theoretical results in economics, particularly concerning the properties of market competition. Consider the budget set OAB first. An irrational consumer will pick any bundle on the budget line AB with the same probability. 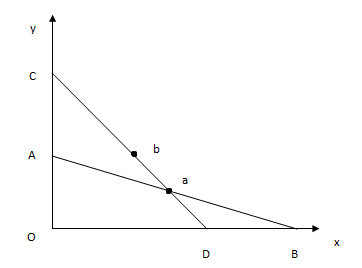 Since the distribution is uniform, the bundle a (which corresponds to the mid-point between A and B) will be chosen on average in the population. Now, suppose that good x becomes more expensive relatively to good y. CD corresponds to the resulting compensated budget line (i.e. the budget line defined by the new price ratio assuming the same real income than before the price change). For the new budget set OCD, the bundle b is now the one that will be chosen on average. Therefore, the compensated demand for good x has decreased following the increase of its price. This implies that the substitution effect is negative, which is a necessary condition for the law of demand to hold. Note however that this not imply that each consumer is maximizing his utility under budget constraint. Quite the contrary, an individual consumer may perfectly violate the law of demand through a positive substitution effect. For instance, one may choose a bundle near point A with budget set OAB and a bundle near point D with budget set OCD, in which case the consumption of x increases with its price. Clearly, there is nothing mysterious in this result which simply follows from a probabilistic mechanism. Becker used it as a “as-if” defense of the rationality assumption for consumer choice. Even if consumers are not really rational, one can safely assume the contrary because it leads to the right prediction regarding the shape of the market demand. As Moscati and Tubaro note in an interesting historical and methodological discussion, most of the experimental studies based on Becker’s theoretical argument have focused on the individual rationality issue: are consumers really rational or not? As the authors show, it turns out that Becker’s article and the subsequent experimental studies only offer a weak defense of the rationality assumption because they only show that rational choice is a plausible explanation for demand behavior, not the best explanation. Surprisingly however, the most significant economic implications of Becker’s argument seem to have been largely ignored: the fact that individual rationality is of secondary importance to study market demand and that only “collective” rationality matters. This idea has been recently developed in several places, for instance in Gul and Pesendorfer’s critique of neuroeconomics and in Don Ross’ writings on the scope of economics. The latter offer a sophisticated account of agency according to which an economic agent is anything that fulfills some consistency requirements. Contrary to Becker, Ross’ approach is not grounded on an instrumentalist philosophy but rather on a realist one and provides a strong defense for the representative agent assumption in microeconomics. The problem with this approach does not only lie in the fact that it excludes from the scope of economics all issues related to individual rationality. More significantly, as I already note in the preceding post, it has significant implications for the relationship between positive and normative economics. Welfare analysis has been traditionally grounded on the preference-satisfaction criterion. The latter is justified by the fact that there is an obvious link between the preferences of an (individual) agent and the welfare of a person. The link is lost under the more abstract definition of agency because there is no reason to grant to some abstract market demand function any normative significance, despite its formal properties. Added to the fact that the irrationality of consumers makes the preference-satisfaction criterion meaningless, this makes necessary to rethink the whole link between positive and normative economics.